Mumbai, December 2018: It’s that time of the year to shop till you drop! Head to Shoppers Stop for the End of Season Sale and enjoy up to 51% off on the most fashionable Indian and International brands across categories at Shoppers Stop stores, website and mobile app. Shoppers Stop offers over 400+ premium brands with a wide variety of product assortment spread across categories - apparels, beauty range, footwear, watches, sunglasses, accessories, handbags, luggage and home décor. Additionally, Shoppers Stop Golden Glow First Citizens can avail extra 5%* discount (as First Citizen Reward Points) on the nett prices of sale merchandise. 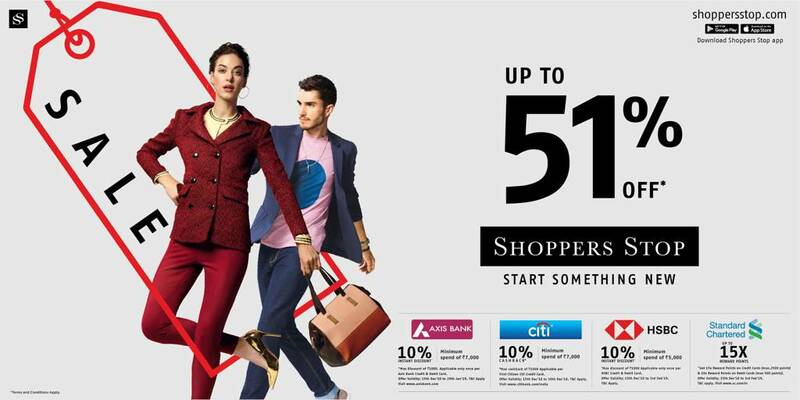 What’s more, Shoppers Stop customers can enjoy additional discounts on purchase above INR 5,000 from HSBC credit and debit cards and purchase above INR 7000 from Axis Bank credit and debit cards. Customers can also avail 10% cashback on purchase above INR 7000 from the First Citizen Citi credit card. Additionally, customers can get up to 15X reward points on Standard Chartered credit card and 10X reward points on debit cards respectively.